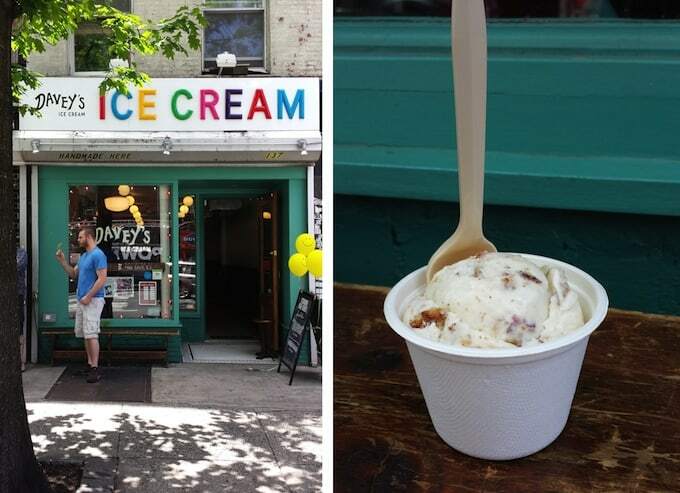 Keep cool this summer by checking out these 10 best ice cream and frozen treats in NYC! Summertime = Ice Cream Time. 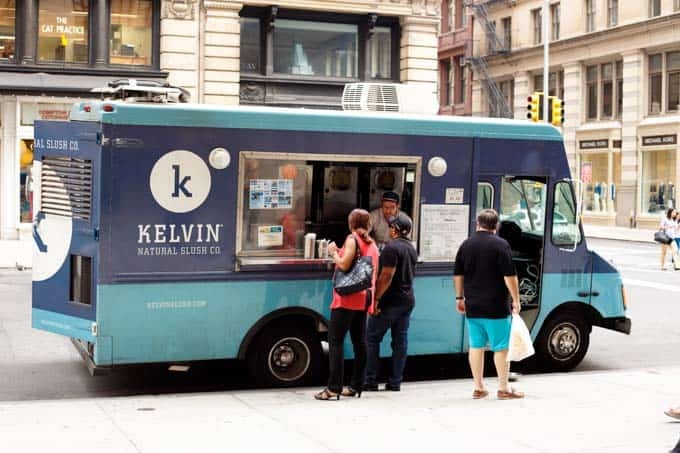 When the temperature rises, NYC loves to get their frozen treat on. It’s funny. At this point, most of my friends, family, and random acquaintances know about this little corner of the interweb called Shared Appetite. And when they travel into the city, I often get asked the question… what do we eat?! I love that question. I love sharing my love of food with others. And whenever someone asks about ice cream places, I know I have a great list to share with them. Because, well, I’ve definitely eaten my fair share of ice cream. Possible 2 dozen fair shares. Eh, let’s not put a number on it. How abut we just say that I’ve eaten enough ice cream and frozen treats to be 100% confident where my favorites are. And you know what? You deserve to know too. Because we don’t want to waste precious stomach room on anything but NYC’s greatest and finest. You deserve the 10 best ice cream and frozen treats in NYC. You’ve all heard of Mister Softee, right? If you haven’t, I’m sorry. I’m truly, deeply sorry. No child should have to grow up into adulthood without first experiencing the joys of that creamy frozen deliciousness. Anyway, the 2 guys behind Big Gay Ice Cream are like Mr. Softee gone rogue. They literally rented out an ice cream truck one summer long ago, and started pumping out these soft serve cones with wacky and creative flavor toppings. 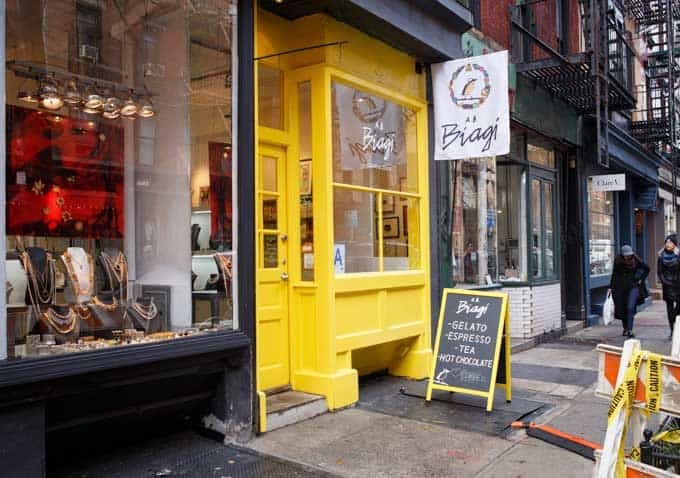 It didn’t take long for them to open up shop in the East Village (and then the West Village). Now they are expanding their gay empire to L.A.
Big Gay Ice Cream is typically one of the first ice cream shops I always recommend to people. Why? This is the Bea Arthur. 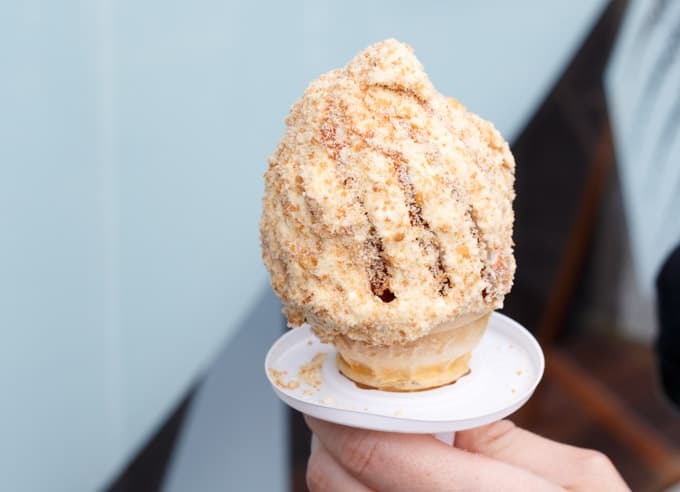 It’s vanilla soft serve that studded with dulce de leche and then smothered in crushed up ‘nilla wafers. It’s my go-to order every time at Big Gay Ice Cream. And if you want bonus points, order a Mexican Coke to go along with it. It makes the experience all the better. Promise. But here’s the thing. 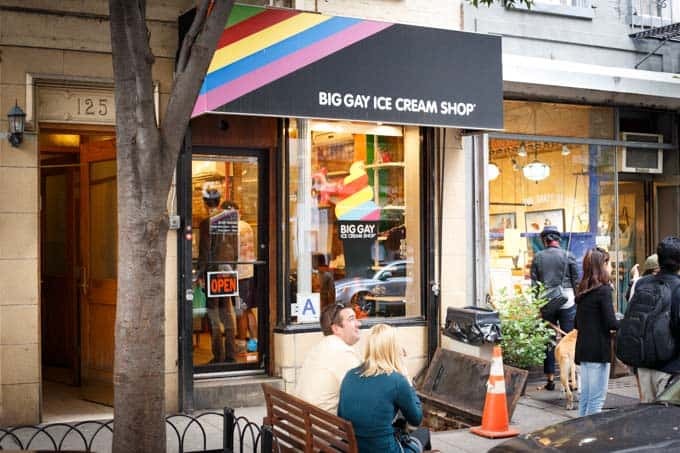 If it’s your first time at Big Gay Ice Cream, I might just have to recommend that you get their signature… The Salty Pimp. It’s vanilla soft serve that studded with dulce de leche, sprinkled with sea salt, and then covered in chocolate dip. It’s an addictive play on the salty-sweet flavor combo. Best case scenario? Either be a champ and order both, or go with a friend and share. This is my favorite gelato in the city. It’s incredibly smooth, intensely rich, and they have a huge selection of creative flavors that rotate regularly. Mascarpone. Creme Fraiche. Avocado. Sounds weird, right? Nope. They are all amazing. And don’t worry, my extra weird friends. They have even more unique, wacky flavors than that. My absolute favorite though is their Dark Chocolate Gelato. You need to get it. Please. Do it. And then email me immediately to thank me, because it’s going to change your life. But hello surprise out of left field… I never, read NEVER order sorbet. Like, who orders sorbet when there is gelato on the line. But they have such a large selection of amazing sounding sorbets, last time I went, I decided oh heck, why not… And people. Their sorbets are AMAZING. Sorry for yelling, but it’s that important. 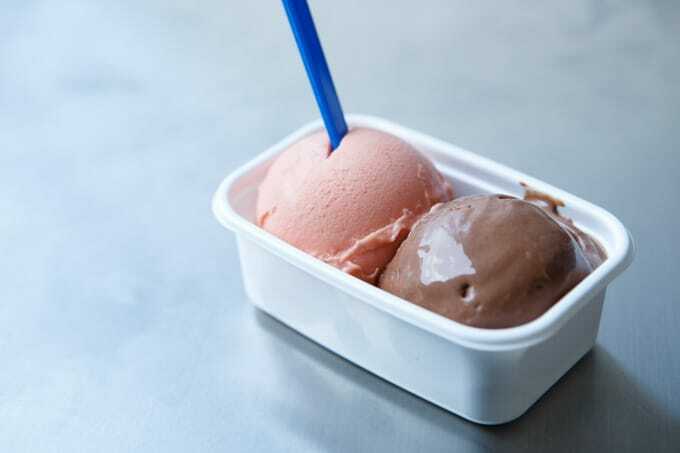 That’s the nectarine above (next to dark chocolate gelato , of course). It tasted like you were biting into the most ripe, perfect nectarine you’ve ever tasted. It was so refreshing and for a brief moment, felt the epitome of summer perfection. Insider tip… they let you sample a few flavors, so live dangerously and sample some flavors you find intriguing, but weird. You may surprise yourself! Coolhaus. You might as well read ice cream sandwich perfection. Freshly baked cookies. 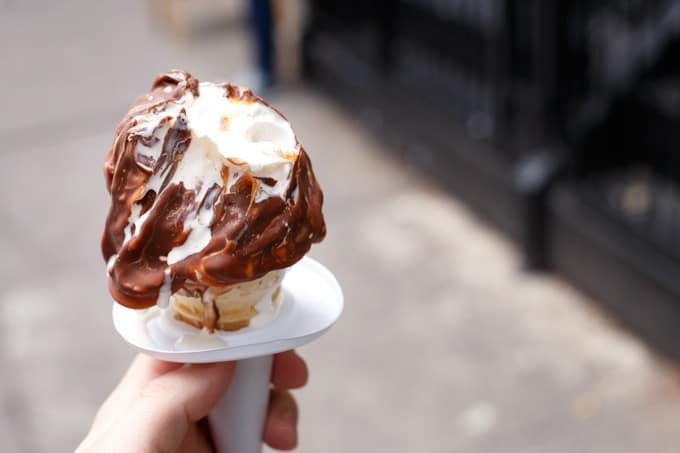 Ice cream held at the perfect temperature… just at the point it’s a little melty and dripping down your palms, which forces you face plant into the ice cream sandwich with eager ferocity. Here’s the catch. It’s a food truck. You’ll need some patience (and basic smartphone operating skills) to find this goodness. Just log onto their website (see below) to find out their current location. And when you find it, do a happy dance, because you’re about to descend upon ice cream sandwich greatness. Pick your cookie flavor. Pick your ice cream flavor. Heck, you can even pick 2 different cookie flavors if you swing that way. My favorite cookie? The Potato Chip Skor Bar Cookie. Now, the flavors of the cookies and ice creams rotate daily, so don’t be disappointed if that’s not available. They’ll have plenty to choose from. As far as ice cream goes, my top 2 are either the Brown Butter Candied Bacon or the Brown Butter Chicken n’ Waffles. Yea, I know. It’s a bit strange, but it’s stupid good. Insider tip: look on their twitter account for the daily secret password. Tell the person in the truck the password of the day for $1 off (you need to buy 2 sammies though). Moving Target: check website for truck location! This is one of summer’s greatest secrets. Like, if it’s crazy hot and I can’t get cool, I need me a Kelvin Slush. If I have a thirst that no amount of water will quench, Kelvin Slush saves the day. Every time. 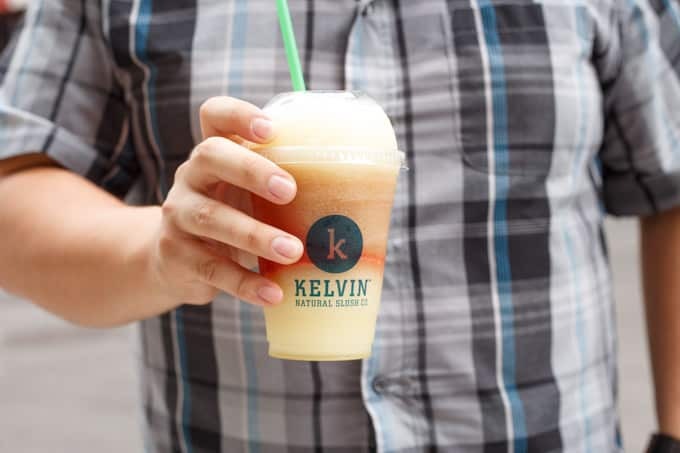 Kelvin Slush offers up a natural, sophisticated take on the childhood favorite. You pretty much need to order the Arnold Palmer, which is a combo of their lemonade slush and sweet tea slush. You can also add a fruit shot into the mix. That’s strawberry you see swirled in the slush below. And that dude holding it is Steve. He’s a big Kelvin Slush fan. And Steve knows his slush, people. Welcome to Tyler’s favorite frozen treat in the city. 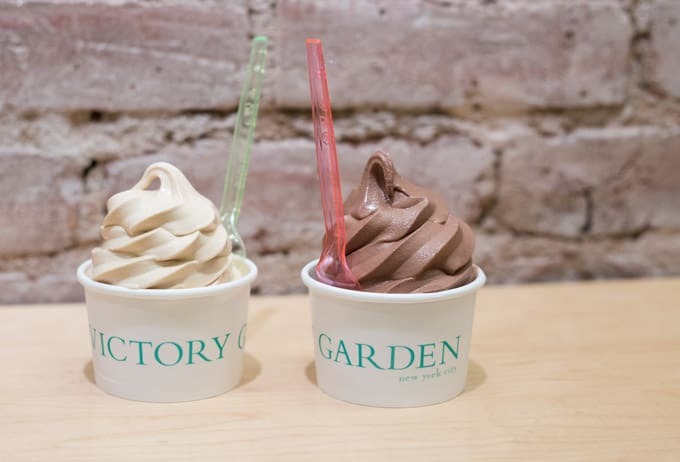 Victory Garden serves up soft serve goat’s milk ice cream. They normally have like 2 to 3 flavors daily, and almost always have salted caramel. You need to get the salted caramel. It’s pretty darn amazing. UPDATE: THIS LOCATION IS NOW CLOSED… yes, I’m as devastated as you are. See the bottom of this post for 2 new recommendations! Davey’s Ice Cream is a relative newcomer on scene. I’ve only had it about twice so far (oh don’t you worry, I’ll be building that number up in the coming weeks), but I’m fairly confident in saying their ice cream is pretty spot on. Specifically, I’m loving their Brunch Ice Cream. I think it has bacon, maple, and pieces of French toast in it. Don’t quote me on the specifics, but it’s freaking good. A.B. Biagi. It’s not just a gelato shop. It’s a person. Antonio Biagi grew up as an Italian living in Brazil. 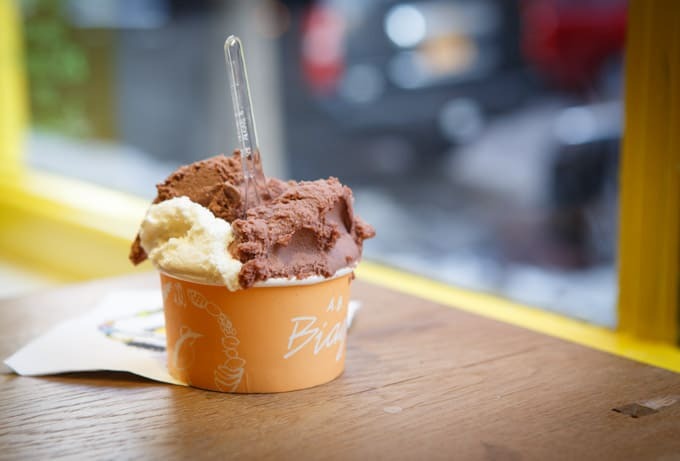 His shop celebrates traditional gelato (he studied with master gelato makers for years and years to perfect his craft) with hints of flavors from his Brazilian childhood. I actually got to spend some time talking with Antonio and the dude is so passionate about what he does. It’s so refreshing to see. He wants you to love gelato the way he does, and his love for his craft defintiely shows through in his product. The flavors rotate regularly, but one thing to note is that he has amazing dairy free options. In particular the dairy free peanut butter is insanely popular. I also tried the dairy free acai-banana, which was ridiculously creamy and intensely flavored. A.B. Biagi is a sweet genius! You can never have too many ice cream sandwiches. 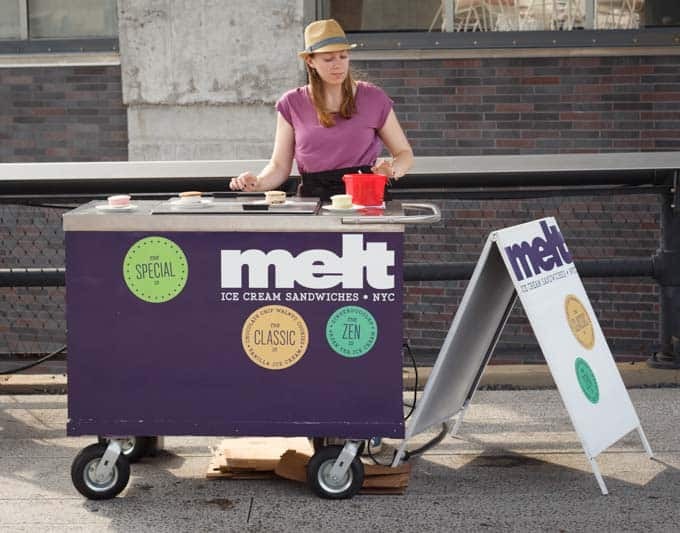 Although Coolhaus is probably my favorite, Melt also deserves your attention. 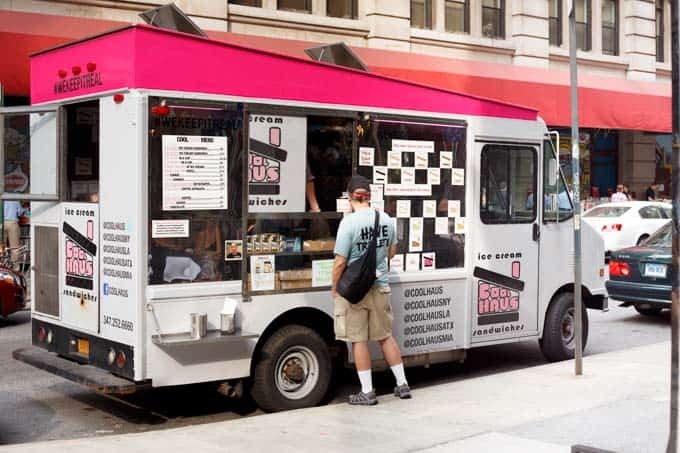 They typically have a cart set up on the Highline each summer, or you can always find them at their Lower East Side permanent storefront. 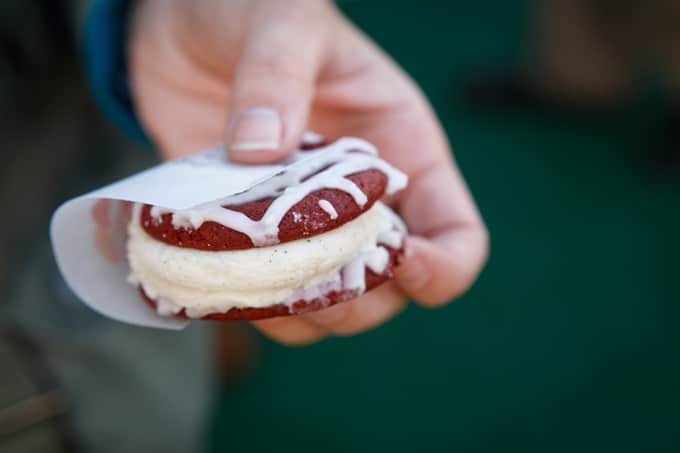 The ice cream sandwiches are assembled ahead of time and frozen rock hard, so you’ll need to let them thaw a bit in order to achieve the optimal enjoyment factor. Sometimes I’m too impatient for this step, but it’s important. You want the ice cream to be soft and a little melty. Flavors rotate regularly. I’ve enjoyed the Zen (some sort of green tea concoction), and the Lovelet (red velvet and cream cheese). Technically, this place is a burger joint. And there’s a bunch of them throughout the city. The burgers and fries are good. And they are actually known for their organic, wacky burgers like ostrich, bison, elk, and lamb (don’t worry, they have normal stuff too). 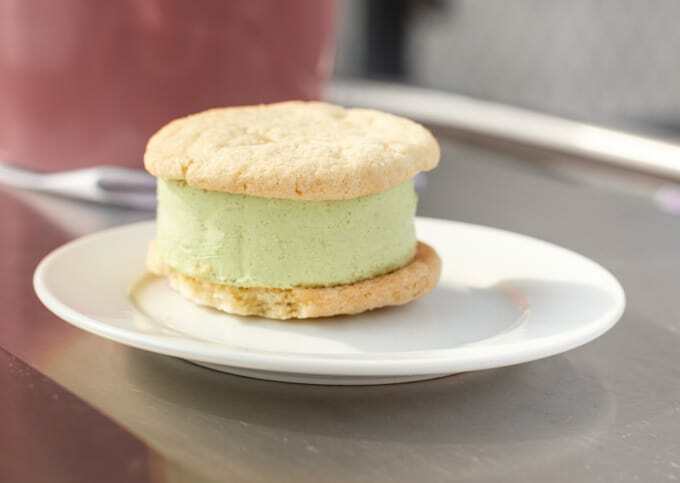 UPDATE: they now also serve Coolhaus Ice Cream Sandwiches at Bareburger!!! Wouldn’t it be great if gelato was more portable? 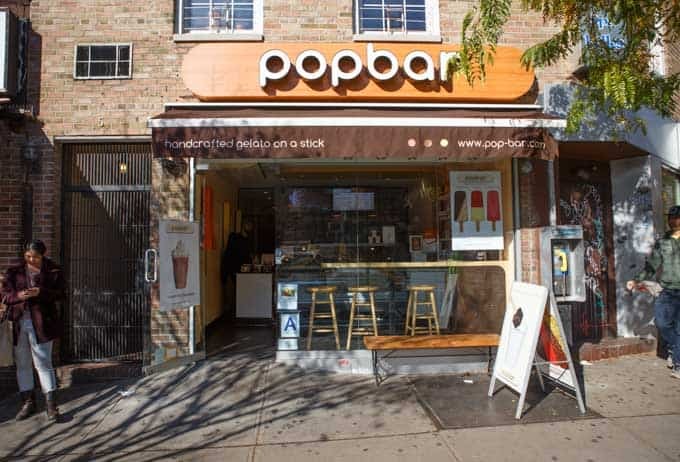 Enter Popbar. 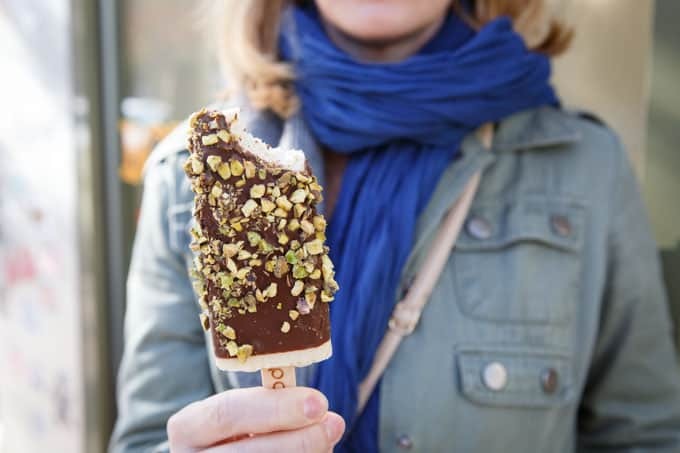 Gelato on a stick. You can get a bunch of different flavors, dips and toppings. It’s completely customizable. That’s vanilla with chocolate dip and roasted pistachios above. Don’t be jealous. Go get your own. Bonus. This is #11. Sorry, I couldnt’ just stop at 10. NYC is too good. Don’t mind the terrible quality photo of gelato. Apparently the only photo I snapped of the triumphant gelato marvel was from like 18 years ago on my flip razor cell phone. And that photo on the right was back when me and the Mrs. were dating. I wined and dined her right. Otto is Mario Batali’s casual pizzeria and enoteca. There’s a bunch of great pizza, pasta, and antipasti to be had. Ohh, and wine. You need wine. But that’s a different post. You’re here for gelato. Feel free to step up to any of the standing tables in the bar area to order your gelato, or just get it to go. There’s a bunch of different flavors of gelato and sorbet to choose from. 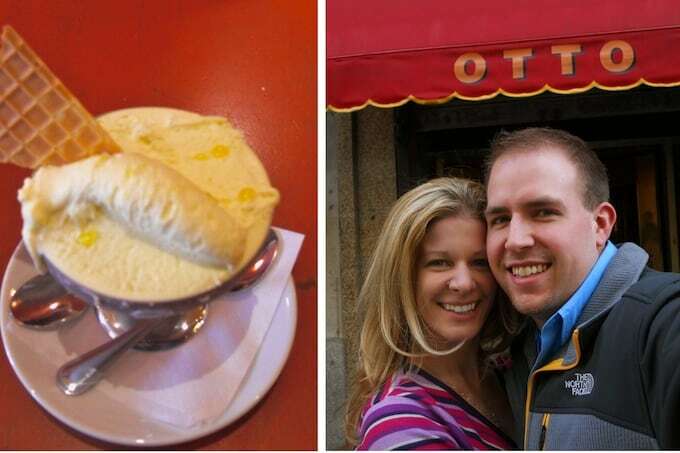 I always go for the Olive Oil Gelato. And stop with the that sounds weird stuff. Just trust me already. It’s fantastic. You’ll love it. Think old school ice cream parlor… reimagined in a whole new way. The place looks retro (complete with toppings in apothecary jars and all), but the flavors are anything but. Sure, there’s vanilla. 5 different varieties! 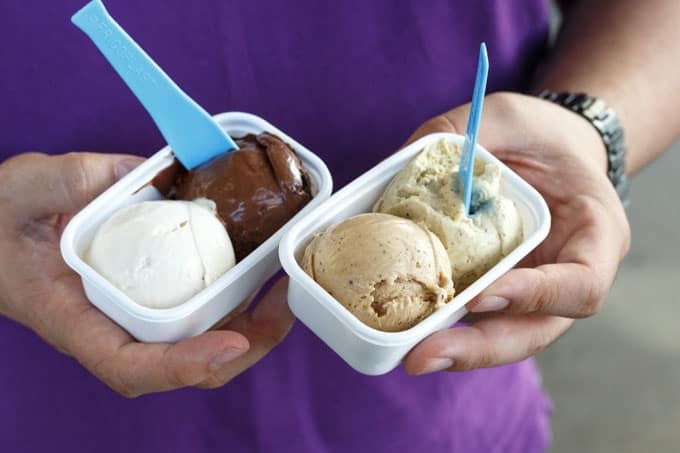 And every one tastes totally different, as Morgenstern’s somehow is able to capture incredible nuances in flavor while maintaining incredible ice cream consistency. Yeah, this place is legit. You really can’t go wrong with any of the flavors, but I’m always one to try the weird ones… Balsamic Strawberry, Salt and Pepper Pine Nut, Buttermilk… all absolutely legit. Just don’t ask me to try the Durian Banana (again). It’s a flavor I soon won’t/can’t forget. My buddy Steve really liked it though. Well, as much as one can like Durian. I always also make sure to try all the different vanilla varieties, because it’s really crazy how different easy one tastes (while at the same time still being… vanilla). Ice & Vice Ice Cream. So this is totally not your average ice cream shop. They are ice cream with an incredibly experimental edge. All the ice cream is handcrafted in small batches, and they happily push the flavor boundaries to the point where I’m always just a tad uncomfortable. Seriously, you read the menu and you’re 100% confident that some of the flavors are not actually ice cream. Then you taste it… and you cry. Because your brain cannot comprehend how the sweet geniuses behind Ice & Vice could first ever dream up such a concoction, and then deliver such an incredibly well balanced and flavorful ice cream. 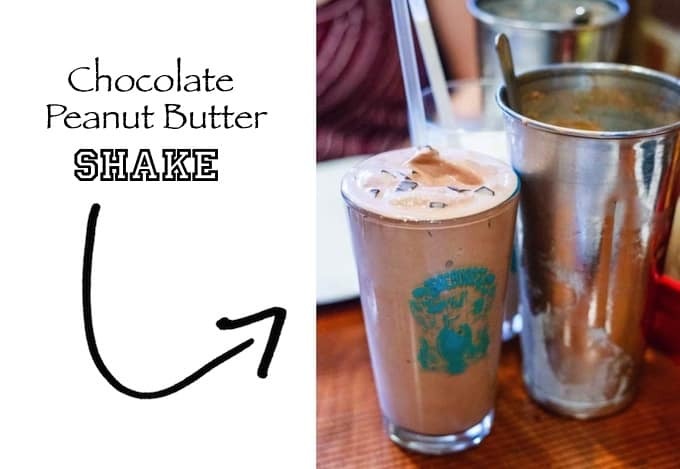 Sure, they have some more normal flavors on the menu that are “regulars”… Milk Money (an updated fudge swirl with a toasted milk ice cream base) and Shade (a smoked dark chocolate ice cream) are two that I’ve tried and loved. But honestly, you are here to push yourself to the edge of ice cream euphoria. And these flavors change regularly. Some of my favorites from recent trips are Farmer Boy (Black Currant ice cream with Goat Milk and Buckwheat Streusel), Splinters (Smoked Whiskey Barrel Wood ice cream with Cracker Jack Brittle), and Tico Time (Pink Guava ice cream with Chili Lime Plantain Chips). Yup, that’s what I’m talking about. And don’t worry, they get even weirder… I mean more experimental… than that. Man I love these guys. Every time I get to try something new, and every time I’m blown away. Psst. Vegan and dairy free friends. They always have at least 1 flavor for you as well! Cones Ice Cream is an Argentenian owned shop that scoops up some creative flavors. I love their corn ice cream, lightly dusted with cinnamon. Technically, Jacques Torres is a chocolate shop. Yes, his chocolates are amazing. But during the summer, he also offers ice cream sandwiches. 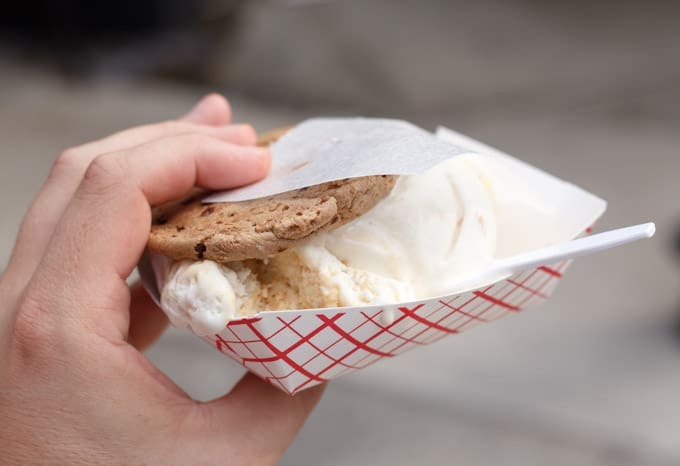 Vanilla ice cream sandwiched between 2 giant chocolate chunk cookies? Yes please. It’s high quality stuff. The fast food icon has a cult-like following for burgers and fries, but the true culinary gem at Shake Shack is actually their concretes. Thick, creamy custard blended with whatever toppings you choose. They always have vanilla and chocolate custard, as well as seasonal flavors that rotates daily. During the winter, I love their candy cane crunch. It’s the bomb.com. And really, you can never go wrong with any flavor. I first had Van Leeuwen ice cream off of their roaming food truck. They’ve since opened a permanent home in the East Village. Van Leeuwen is kinda like the “farm to table” of the ice cream world, sourcing out local, all-natural ingredients. I’m a huge fan of their vanilla ice cream. It’s intesely flavored and sports a beautiful, rich complexity. I know what you’re thinking. Wafels + Dinges is great, but they aren’t ice cream or a frozen treat! Hold on, hold on. Actually, now they are serving up wafels topped with speculoos ice cream. Don’t know what speculoos is? I’m so sorry. You’ve been missing out. So go and get some immediately. Now that’s a plan Sandra!!! 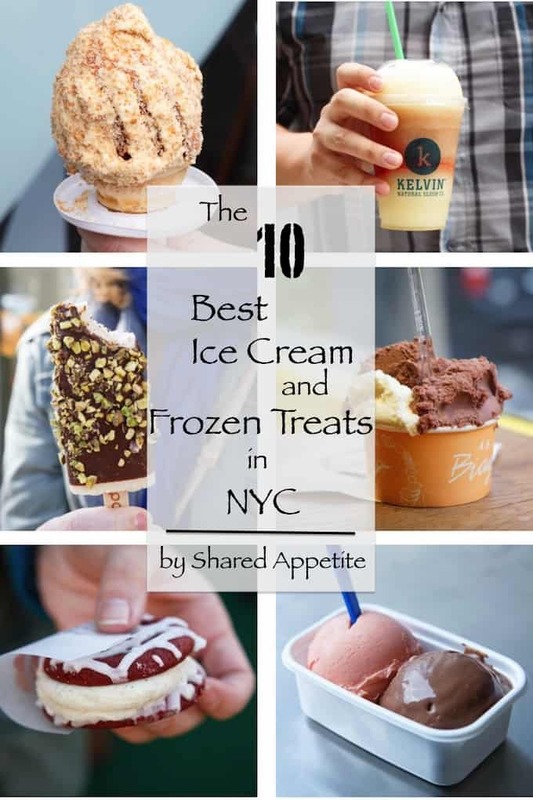 I definitely need to get to NYC and check out some of these delicious treats! So many great choices. Love the photo of you and Asheley. Yes, come to NYC Melanie!!! OMG, Chris this is making me drool on the other side of this computer! I am SO looking forward to working on that list you sent me this spring of NYC foods to eat! ALl these ice cream places if they weren’t on it before, definitely will be added. I remember we almost went to big gay ice cream and then didn’t. I think we went to milk bar for a second time lol. Thanks so much for all the restaurant info!! You rock! Can’t wait for you to join us in NYC Kelly! You are going to love it!!! Thanks for the post Chris!! I will try one of these when I visit NYC next time. Yes, you totally need to try every single one Dannii! What about GROM David? I personally love it. Also the ice-cream they sell at Eataly is pretty awesome. I’ve been to Grom, but not the one in NYC actually. I figured since it’s an international chain, I’d feature more hometown local type places. 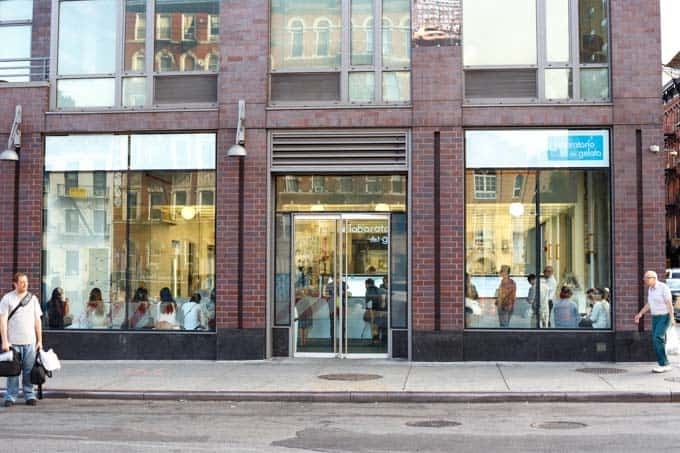 And I haven’t tried the Eataly gelato yet… I’m guessing it’s similiar to the one at Otto? Ugh…sorry for the “David”…I was drunk when I typed that comment. Anyway, I discovered that GROM is Italian…same as Eataly. Both way better than Otto imo! hahaha David, Chris… all the same wolfpack! Why, oh why, do I not live in NYC?!? All I want in life right now is a salty pimp. <– this is possibly the weirdest sentence I have ever typed. Hahaha that sentence is perfectly normal to me lol!